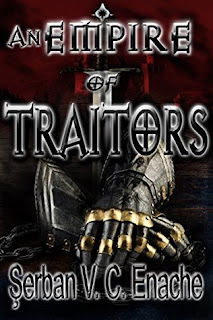 An Empire Of Traitors follows several principal storylines simultaneously. It's been eight years since the end of the civil war between the Inquisition and emperor Zygar Ferus, worshiper of blood gods. Eight years into the aftermath, a new emperor sits the Sun Throne, and the Inquisition is no more. In the five realms of the Empire things are stirring. Driven by ambition or wounded pride, many nobles like the dog-headed serpent of Stoneweed seek to change their fortunes, even with the price of treachery. And from exile, from the heathen nations of the Lowlands, another Sunborn scion of house Mero gathers strength behind his claim. No family, great or small, shall remain indifferent to fate's whim. It takes an emperor to rule an empire, but it takes numbers and honored oaths to keep both crown and throne. In the Westlands, Drakanes, a sister of the temple finds herself in the role of witness and proctor, of passing judgement on a man accused of murder, who claims to have been possessed. The trial's proceedings enlighten her as to the truth of it all, and the good sister is willing to, out of pure stubbornness, risk death for justice. Emperor Hagyai Rovines Mero fears for the continuation of his line, and sends Sycarus on an errand to the Desertlands to bring back an Aharo maiden for his son and heir. It is said that the Aharo savage women always give birth to healthy babes. Hagyai Rovines desires a betrothal between the prince heir and a savage girl - trying to emulate a long dead custom of the Sunborn emperors. Such a move is most unpopular, and the whispers of another civil war are once again in the air. The imperial chancellor warns Birus Mandon, lord of Rivermark and warden of the Streamlands, of a plot against the emperor, a plot made by his exiled brother, Amarius Soronius. Mandon tries to gather knowledge on the schemes of potential oathbreakers, but his trade is not that of a spy. When he hires the Mounted Arrows Company of Narak al Zull, Birus learns more than mere outlandish tactics; he finds a new source of strength in the sellsword's foreign warrior god. This is the beginning of a very epic tale. There are dozens of characters and storyblines that are woven together - somewhat. I think as we go along things will become quite a nice tapestry of the world. This isn't just epic in the character count, but in the size of the world and realms. We go from nomadic desert kingdoms to frigid northlands and the places in between. There are hints of magic anc magical creatures, although I have yet to see one outside of dreams. There is a lot of setting up the various story lines and beginnings. Almost too many. Outside of the usurper timeline, many of them didn't seem to go anywhere yet. This was a little disappointing because I really like to see forward progress and development of all the little pieces. I'm sure these will be continued into the next book and I hope to see a lot of great things. I just wish more of those great and exciting things had happened in book one. When Grayling’s mother, wise woman Hannah Strong, starts turning into a tree, Hannah sends Grayling to call “the others” for help. Shy and accustomed to following her mother in everything, Grayling takes to the road. She manages to summon several “others”—second-string magic makers who have avoided the tree spell—and sets off on a perilous trip to recover Hannah’s grimoire, or recipe book of charms and potions. By default the leader of the group, which includes a weather witch, an enchantress, an aspiring witch, a wizard whose specialty is divination with cheese, and a talking and shape shifting mouse called Pook, Grayling wants nothing more than to go home. Kidnapping, imprisonment, near drowning, and ordinary obstacles like hunger, fatigue, and foul weather plague the travelers, but they persist and achieve their goal. 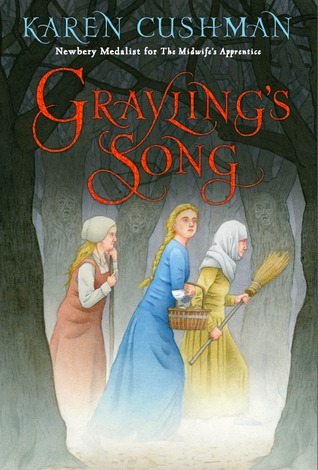 Returning, Grayling finds herself reluctant to part with her companions—especially Pook. At home she’s no longer content to live with her bossy mother, who can look after herself just fine, and soon sets out on another journey to unfamiliar places . . . possibly to see the young paper maker who warmed her heart. She manages to accumulate quite the variety of people. I loved how their personalities clashed and blended together at times in such a fun and realistic way. You like each one of them for different reasons and they are full of surprises - especially one of them! What may be the downfall for some middle graders is the language. There is nothing foul or inappropriate, but it is very period specific. 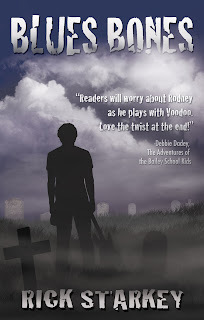 I could see some of the more reluctant readers struggling with reading and understanding it. Do You Believe That The Government Has Your Best Interests in Mind? This Dystopian Thriller Will Make You Think Twice! In 2084, Aaron Trudeau is about to graduate college and enter the real world. As he learns that most everyone is blinded by the government's accomplishments, Aaron seems to have more and more doubts. He signs up to join the SSP, Sovereign Social Protocol, better known as "The Council," more out of defiance than a civic duty. As he treads deeper into the SSP, his covert plan derails as he discovers there are more horrific practices than even the SSP could imagine. If you've been looking for an exciting new dystopian thriller, this is it! 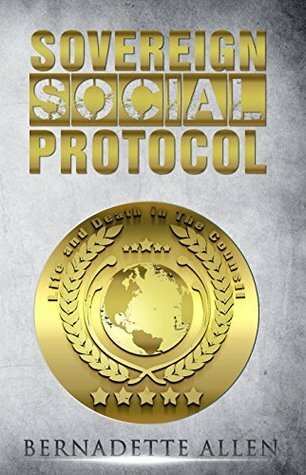 Sovereign Social Protocol will leave you so enthralled that you won't be able to put it down once you start. Great world concept. This dytopia almost sounds like a utopia at first - but isn't that how they all seem to begin? With The Council in control of everything - no one really needs to do anything, except agree and fall in line. 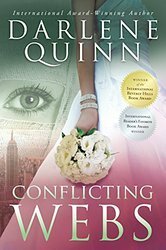 This book is about what happens when you don't quite agree, and you don't fall in line. Unfortunately, the actual story just didn't live up to expectations. Aaron is almost childlike at times - ruining his college age character and the way I veiwed him throughout the story. Towards the end of this book I did see a bit of a more analytical problem solving adult start to come through, but it took a long time to get there. The story line is a little jumpy, but it does move along nicely. There is action, sci-fi, and even some good family drama. It was a bit jumpy at times, it seemed like some scene breaks weren't included and it made some of the transitions a bit hard to follow. Ponds are the most fabulous place for discovering all kinds of wonderful things! There are plants, insects, birds... and, of course, beautiful green frogs. Sometimes, one can even find fish, such as the flamboyant koi. But the koi has not always been king of the pond. There was a time when it was just an ordinary black-and-white fish. 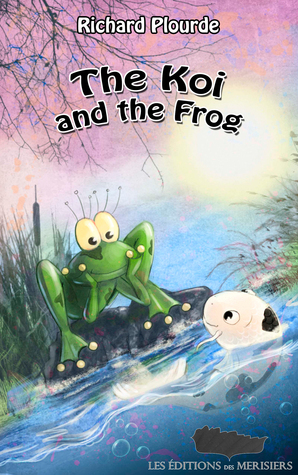 This was before Bekko, a young koi, fell in love with Matsou, the pretty frog. Here is a colourful love story like no other. This story was so adorable. I loved Bekko the fish and his persistance and devotion to Matsou the frog. He stayed by her side even when she was sad and even when she hibernated - visiting her every day even though she couldn't know if he was really there or not. The learning lesson kicks in when he hears the story of her childhood and her wish gone bad. A very fun tale that kids will really enjoy. Twenty years ago, Terry Brooks turned fantasy fiction on its head with The Sword of Shannara, the first fantasy novel to make the mainstream bestseller lists, and the first in an unbroken string of thirteen bestselling books. Now, in Running with the Demon, Brooks does nothing less than revitalize fantasy fiction again, inventing the complex and powerful new mythos of the Word and the Void, good versus evil still, but played out in the theater-in-the-round of the "real world" of our present. A novel that weaves together family drama, fading innocence, cataclysm, and enlightenment, Running with the Demon will forever change the way you think about the fantasy novel. As believable as it is imaginative, as wondrous as it is frightening, it is a rich, exquisitely-written tale to be savored long after the last page is turned. This is the story of the world before - the world of man and technology - before magic returned to the world and the Shannara Chronicles began. Many times throughout the stories the past is referenced and the remains of ruins of our world can be seen in the forests and swamps of the world of Shannara. How did this happen? 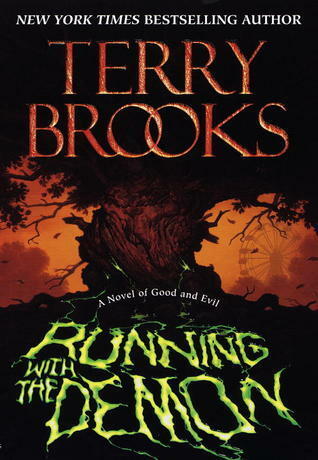 Well, start reading Running with the Demon to find out. This one just didn't do it for me. I'm not sure if it was the sudden change from a high fantasy style to a completely urban fantasy - or that it was set in a town not too far away. I just couldn't see it in my head or connect with the characters. Nest is a very special teenager, from a very special family line. on her shoulders may rest the very furture of the world as we all know it. I had a hard time connecting with Nest as the story went on. her relationship with her friends, family, demon, creatures, and John just never rang very true for me. It also takes a long time to get anywhere of significance in the storyline. I really had no clue why any of this was so important until about half way through the story. This made it a little difficult to keep going from chapter to chapter at times. Brooks writing is still very beautiful and he has a way of bringing a scene to life, this just wasn't one of my favorites. Aria is on top of the world. Her father finally supports her dream of becoming an opera singer, her friendship with Maxime is off to a great start, and she’s reconnecting with her estranged mother before the start of her second year at the National Academy of Arts in France. But all that’s overshadowed when she realizes her voice’s limitations could prevent her from becoming a famous singer. Torn between her wish for fame and her desire to stay true to herself, Aria will have to choose what singing really means to her and what she’s willing to sacrifice in order to succeed. 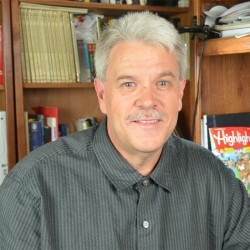 Born in France, raised partly in the United States and in France, I grew up loving stories in French and English. I currently live in Paris where I pursue my studies as a Law Student. I'm the author of the French Girl series. When I'm not writing, I enjoy traveling in Europe and dream of going to Asia and Africa. 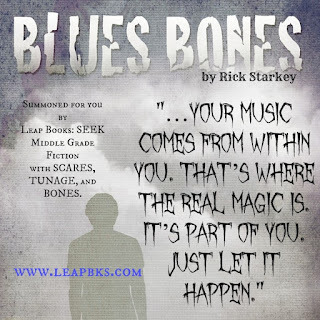 and join my newsletter for exclusive news about my books. This was a very fun story! The author does a great job telling the story from Madison's point of view, and I love the look even deeper into her thoughts as she writes her blog/diary posts. She's a suprising down to earth, yet crazy character that just has tons of personality. 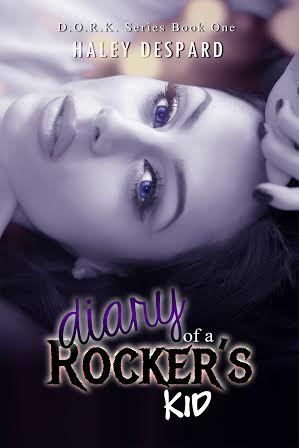 Her whirlwind beginning of finding out who her family really is, was written very nicely. I love a good melt down scene when the circumstances call for it. And these definitely did - and one was very nicely provided. It helps keep the character real by showing that even she can become overwhelmed. There are a lot of typical teen problems in the story - boys, looks, fashion, gossip, friends - but because they are typical I believed them. I did figure out the bug mystery before Madison did, but I think that was mostly a lucky guess. I'm very curious to see what is in store next for her. 1) Can you tell us a little about your writing process and what inspires you? I think it’s girls that inspire me. I don’t want anyone to have the kind of teenage years I had. I was in the wrong environment and there was nothing to nurture the creative aspect of my makeup. The female species is so powerful but somehow, that knowledge has gone missing. We have movies and books that tell young girls they need to train and be able to fight like soldiers in order to prevail. I feel strongly this is the wrong path. I want to show girls that if they can learn to be still, if they stay in the moment, everything they need is already a part of them. We have a super power and it’s called instincts. But, we have to learn mental discipline to access them. Nobody wants to talk about disciplining the thought process in order to access our true power but it’s the essential ingredient. As for the writing process, I map it out using a beat sheet and then just start writing. By having a strong outline I can let what happens, happen. 2) As a singer/song writer and now author, how do maintain your creativity and avoid burnout? Yes, well, burnout is a problem. Maintaining creativity however, is not. Right now, I’m working with an extremely talented jazz pianist to pull together the album of Eleanor’s (main character) songs. He’s amazing and we’re working on arrangements and feels. I find that I can’t write while I’m doing music and I can’t do music when I write. It’s a balancing act but that’s not what wears me out. Having to think about platforms and selling stuff, that freaks me out. My brain hates going there, so thank you for doing this. I enjoy answering questions! I think creativity is a muscle. My goal is to pull out of myself every single thing that’s inside me and mix it up with other peoples views. I like a collaborative process as long as I have the right of veto! 3) What is your favorite non-singing/writing activity? I work with a trainer three times week and I love that. I’m not particularly sporty but I like to move. I also can window-shop for hours. Well, let’s be honest, because I perform every week in a club in Melbourne, I need clothes. Ebay is my friend! Oh, and I have one really guilty pleasure. At night, in bed, as I’m having to update the social media thing, I turn on those housewives. They just started to show old episodes here in Australia and it’s astounding how disconnected they are from themselves. I’m sure the edit it to look like that but because I’m quite a private person, their willingness to be exploited is like a train wreck where you can’t look away. 4) Can you tell us what your perfect movie cast for the book would be? If we could get this movie made in time, I would love Elle Fanning to play Eleanor. I think the English actress Maisie Williams would be great as Audrey and just for their faces, Erik Knudsen as Edward and Bug Hall as John. I would also love to see the ballet dancer David Halberg play Lerion. He’s got an otherworldly air about him and he speaks very nicely. I don’t think we could go past Tilda Swinton for Tsera. I can just see it. Now I just have to find the right producer! 5) What is in the works next? I’m doing the album and I’ve started on the second movie called The Living Library which takes place nine months after The Perfect Tear ends and then I’ll write the book. Meanwhile I’ll continue to sing! Thanks you for asking such interesting and obviously well researched questions. 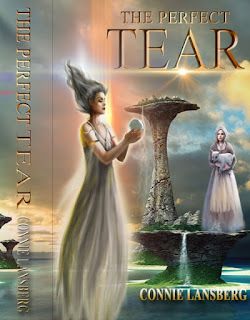 Thank you so much for having me and I’m sure Dorothy has some Kindle editions of The Perfect Tear for your readers. Cheers. Connie Lansberg is a singer/songwriter and now author based in Melbourne Australia. She’s had her Australia’s best loved TV shows that play around the world and The Connie Lansberg Quartet is a fixture in the Melbourne jazz scene. Her most recent original musical project, Alone with Bees, performs her songs written especially for The Perfect Tear. 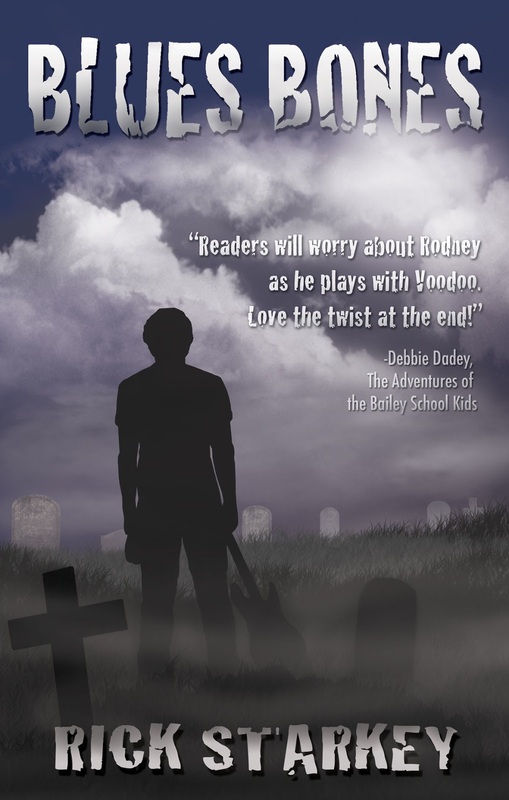 This is Connie’s first novel and the movie is coming soon.